Oh & remember I told you Patty Murray was taking money from corrupt lobbying groups, well it seems that Maria Cantwell was also. Sen. Maria Cantwell responded to the growing scandal involving lobbyist Jack Abramoff by announcing Friday that she will donate nearly $18,000 in campaign contributions to a Native American charity. Cantwell, a Democrat who is seeking re-election this year, had said Wednesday that she would not return contributions from out-of-state Indian tribes represented by Abramoff, who pleaded guilty this week to fraud, conspiracy and tax evasion in a wide-ranging political corruption investigation. But on Friday, Cantwell’s campaign said she had decided to give money to the National Congress of American Indians Education Fund to clear up any confusion caused by media reports about donations related to Abramoff. Cantwell “has never taken a penny from confessed criminal Jack Abramoff,” her campaign said in a statement, but after reflection decided it was appropriate make the charitable contribution. Cantwell wanted “to err the side of caution, so there would not even be a whiff of a connection between his illegal, confessed activities and our campaign,” spokesman Michael Meehan said Friday. The amount being returned, $17,865, includes any funds from organizations or individuals that have ever been connected to Abramoff based on media reports, Meehan said. 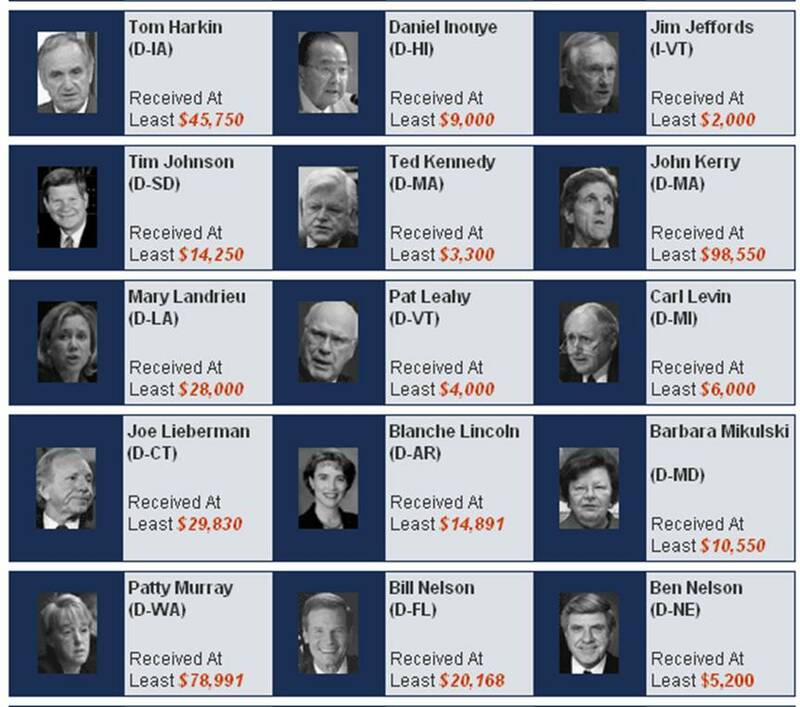 Fellow Democratic Sen. Patty Murray said this week she is keeping nearly $41,000 in tribal donations related to Abramoff. Murray could not immediately be reached for comment Friday. Other Washington members of Congress and former lawmakers also are keeping the money, except for former Rep. George Nethercutt, R-Wash., who said Thursday he has donated to charity $1,000 he received directly from Abramoff and his wife. Nethercutt is keeping $6,000 in campaign contributions from Indian tribes represented by Abramoff. Which brings me back to the question: Why wasn’t P E & G held accountable? Abramoff was working for them, under their direction til he got mad & ran away to another DC lobbying firm. Instead they dissolved Preston Ellis & Gates to become KL Gates bigger & better then ever before & sailed on smooth as you please. Why weren’t all of the Senators listed above investigated & why didn’t anyone make them return the money? Because money is POWER, power leads to corruption. The media, & the press tried like hell to let the people know what was going on but no one was listening. I hear so much about how media doesn’t report on this that or the other & it may just be fatigue, they warn us daily & yet we keep voting for the same morons over & over again. I don’t doubt that there is many cases of censure going on but it kind of seems like they’re damned if they do, or damned if they don’t. …For the present, Durkan said she has no plans. First Assistant U.S. Attorney Annette Hayes will likely take over the office while U.S. Sens. Patty Murray and Maria Cantwell seek a replacement candidate to submit to Obama for Senate confirmation. So Senator Cantwell & Senator Murray PICK the person who is supposed to be investigating them??? What they failed to mention (& that which creates yet another connection) is that our former Governor: is the one who actually hand picked Ms Durkan & made the recommendation to those two ingrates. If you remember Ms Gregoire failed to file some paperwork which cost the state almost 23 million dollars & blames someone else. Jenny Durkan, Commissioner Gibbs, & Judge Robert Leach were all on the WSBA board of Governors at the same time as this circus & magically the complaint against Gregoire goes away & she becomes Governor. All very fairy tail crap. « WA State Supreme Court rules in favor of their Bar Associate, Scott Ellerby, and to SANCTION Scheidler for claiming the courts are corrupt.